I complained about my indecision about what to buy recently. Some decisions have been made, at least for the first round. Replacing crappy stock brakes with Tektro CR720 wide-profile cantis. Using a fork-crown-mounted brake cable hanger to eliminate “brake shudder”. Re-cabling the whole bike including housing. I’ll re-route the shifter cables under the bar tape to allow me to use the bar-mitts. 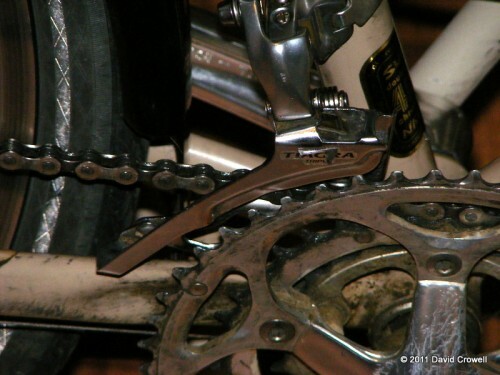 The front derailleur was already replaced by a Ultegra model. It works well. I’m doing most of this work myself. Tom is building the wheels for me. I had considered changing shifters or even going to down-tube shifters. I’m not going to do that. Shifters are stupidly expensive for what they are. Little metal levers to pull a cable cost $100 a set for good ones. Blah. My current bar-ends work fine in friction mode. I still want to buy new front and rear racks, but that’ll have to wait. I won’t need them until my next tour anyway, whenever that may be. I’ll also want front panniers and a handlebar bag with map holder. Although I’m springing for the new dynohub now, I’m waiting on an actual headlight for it. It’s mostly a matter of having the money for everything and figuring out how to mount it. The fork crown on my LHT will be a busy place with fender and cable hanger hardware mounted there. I found the image below of someone else’s bike. They apparently drilled out the top of the cable hanger, and bolted an aluminum strip there to mount the light to. The light I’ll buy won’t quite work like this, but it may be a starting point. I still have plans for other bicycles, but they are on hold for a bit. The LHT really needs work, and I use that bike for many different kinds of rides. We’ll see what 2012 has in store. My poor LHT sat in the kitchen with the wheels off for a couple of weeks, like a Camaro next to a double-wide. As I mentioned yesterday, I worked on it last night, and it’s rideable again. I’m having issues with the transmission. On a car that spells an expensive fix. Technically, you can get a very expensive bicycle transmission, but I’ll leave that to others. My transmission issues center around my front derailleur. Normally it’s a simple thing to shift to one of the three front chain rings. 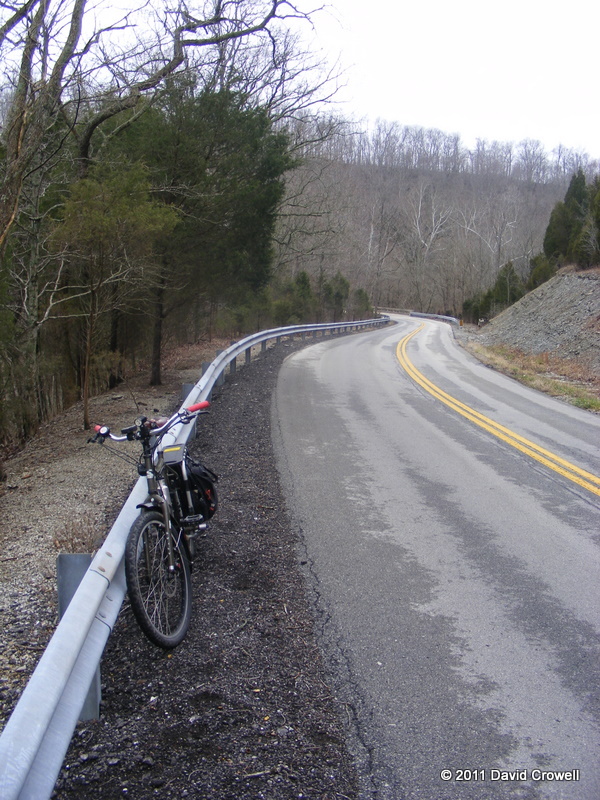 Lately, I haven’t been able to get it to shift into the smallest, leaving me without my “steep hill climbing gears”. Even racing Gravel Grovel, I had some issues, but was usually able to get the shift to happen after several attempts. Usually this issue can be fixed with some simple adjustments. That wasn’t the case this time. The derailleur wouldn’t move far enough inward, even when disconnecting the cable and the limit screw made no difference. Pushing the derailleur inward with my finger will make it go far enough. I assumed this was just mud, muck, and other crud mucking up the works. I cleaned everything the best I could and re-lubed. It made no difference. I stopped at OYLC on the way home from work today confident that they could fix it. Even after soaking the derailleur in a cleaner it didn’t function properly. Okay, the new one is on order and I’ll have it next week. 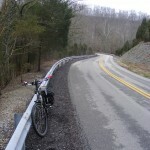 I have a gravel ride coming up on Sunday. I guess if I really need the “climbing gears” I’ll be stopping and pushing the derailleur with my finger again. It’s either that or scavenging parts off of one of my other bikes. I went grocery shopping on Saturday. I bought quite a bit of stuff (including beer!). I hauled it all on the Big Dummy from several miles away. I often go to Kroger which is less than a mile away, but I prefer the ValuMarket at Mid-City Mall. I escaped the madness just as a beer festival that I didn’t know about was beginning. I bought more than I intended and load it all so that nothing fell off was a challenge, but I like challenges. I made it home without losing the load. In addition to the six-pack strapped to the deck, there’s another (Schlafly Coffee Stout) in the bag. I could have hauled more if I had used the wideloaders, but that’s all I needed this time around. I had the recumbent ready on Sunday night for the Monday commute. I rode it to work with no issues. I had an appointment after work to ride to, and I had a few shifting issues. I’ll have to look into that later. I had an appointment with a lawyer before work. I rode the Big Dummy to work, then walked to the appointment. I’m glad I did. Traffic was a mess in the area due to an underground electrical box fire. Even riding a bike through the area would have been problematic. I had ridden the Big Dummy to pick up pet supplies at Feeder’s Supply after work. I normally go to the Downtown location, but I wanted to check out a new route to St Matthews, so I rode my new route through the Richlawn and Beechwood Village neighborhoods to get to another location. 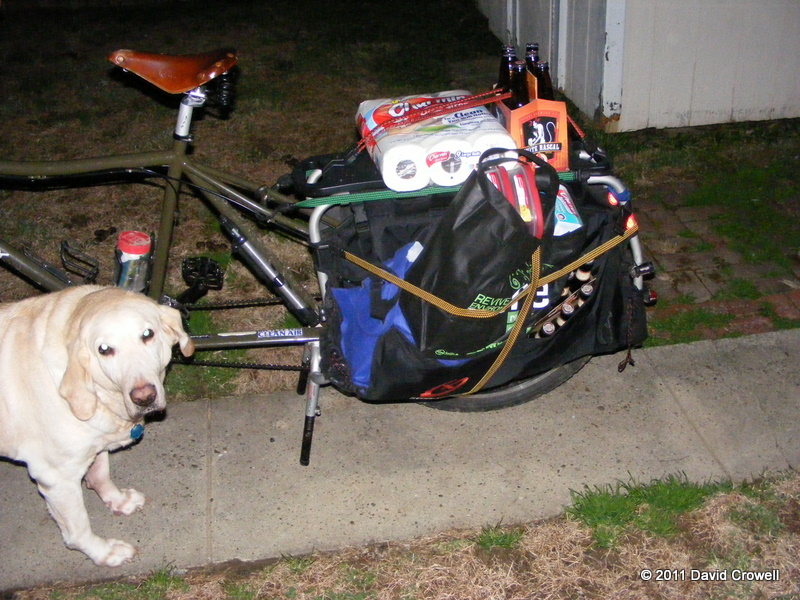 I then hauled 70lbs of pet supplies toward home, stopping at Four Pegs for beer and food. I may have eaten what I shouldn’t have, but I did get over 20 miles in for the day, nearly half of that while hauling pet supplies. Today I had a doctor appointment in New Albany before work. My LHT was still in pieces, so I rode the single-speed. By the time I got home, I had 26 miles. 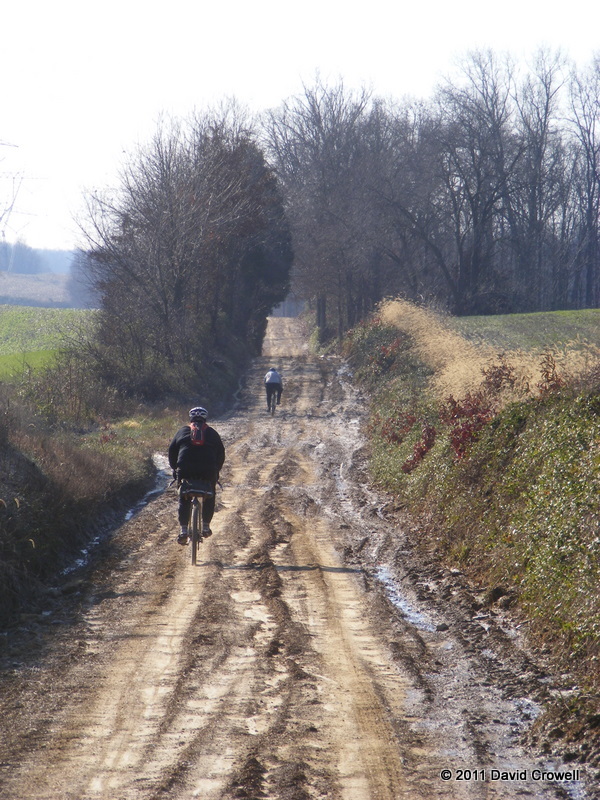 Several of us are getting together this weekend for a gravel ride. My LHT is the bike of choice here, so it was time to put it back together. I cleaned the bike the best I could and reinstalled the fenders and wheels. I cleaned and lubed the drivetrain. I noticed a few issues. I don’t have the money to fix all of this right away. I did have some different pedals in the closet that I put on it. I’ll be stopping by the bike shop for help with the rear hub and front derailleur. The hub because I don’t own any cone wrenches. The derailleur, because I don’t know what’s wrong with it. It could just need replacing. The bike has seen nearly 6600 very hard miles. This is the go-to bike for gravel, rain, winter, mud, and heavy loads (before the Big Dummy). 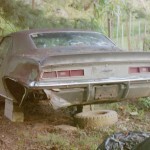 It looks like I’ll be spending a fair amount over the next few months fixing it up. I’ve quit tracking my food intake again. I’m going to start again tomorrow. I’ve been busy and it takes time. Yesterday’s fun at Four Pegs is what happens when I don’t hold myself accountable. I’m still slowly losing. Go figure. I guess it’s a combination of better eating (even with mishaps) and more miles on the bike. 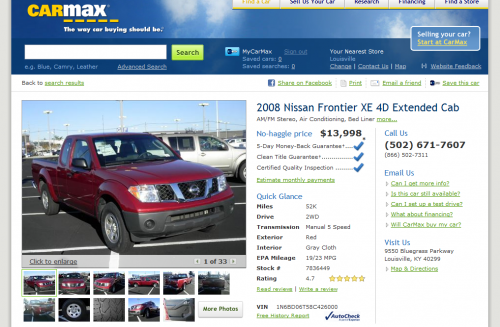 I sold my truck back to CarMax on November 4th. I just checked today, and it’s waiting for a new owner. I don’t regret being car-free. It’s just weird seeing a vehicle I’ve owned selling for five figures. 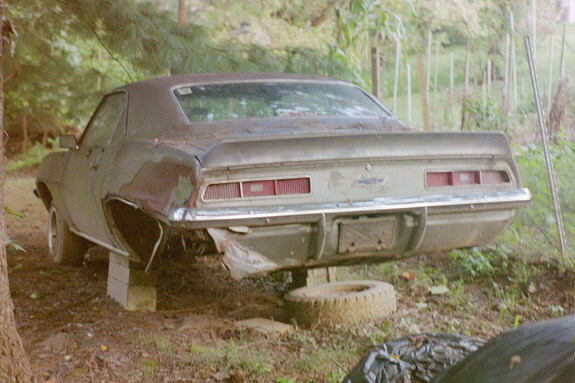 Every previous vehicle I owned was junk by the time I got rid of it.